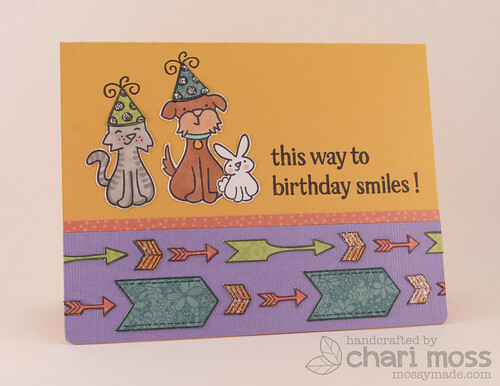 Welcome to a very special Birthday Blog Hop for a very special Birthday Girl, Miss Britta Swiderski! You should be arriving from Marie's blog (which is the beginning of the hop). Britta is the absolute sweetest and I'm so happy to call her my friend. My only wish is that she didn't live far away. Happy, Happy Birthday Britta! I hope it is as awesome as you are! Britta this card is on it's way to you (along with something else super fun!) but it may arrive a day late. That just means you can celebrate your birthday for two days right? So fun! I love the little hats on the animals ...and I really wish I had that set with the arrows! Cute card! I bet Britta will follow the sighns ;) Happy Birthday to Britta! Love everything about this card! So happy and bright!